Selecting a specific letter from each code yields the final secret code of AGMH. 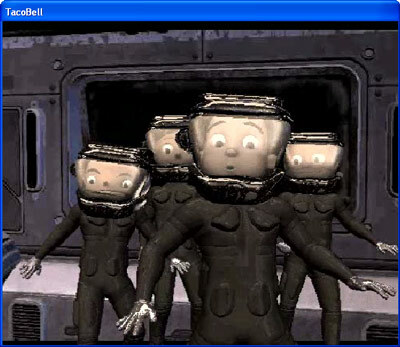 This triggers the final sequence where the 4 Tek Kids take their spaceship up to Havok’s orbiting satellite, where he probably, and foolishly, believes that he would be safe from spying minors. The preceding screenshot captures the Tek Kids’ abject astonishment when they find Dr. Havok and realize that he has totally ripped off Doctor Octopus. Our young heroes defeat the madman by moving around so quickly that the tentacles become tangled and then they maneuver behind to press some auto-destruct button on the suit, which destroys the suit but not the human. A suit from the bureau comes up to the spaceship to apprehend Dr. Havok and congratulate you, thus ending the south of the border odyssey. It was another late work-related night. You know what that means: Another Taco Bell Tek-Kids game! Actually, this is the last one that I have in reserve: Mission: Sky Fortress. Wouldn’t you know it, that wily Dr. Havok is up to his old dirty deeds again when he steals a technological device capable of great destruction. The game acknowledges the passé nature of the good doctor’s exploits by stating that the device will be used for his usual evil purposes, implying that even the game engine is getting tired of this schtick. Conspicuously absent is any overriding environmental theme. Get this, though: the device in question is eXperimental Aerial Aircraft Carrier, the XAA Carrier “Albatross”. I wonder if our brilliant mastermind is aware that that’s not exactly a revered bird of prey? The gameplay features the same dual-maneuvering gameplay mechanic as seen is Mission: Aqua Zone. Using the cursor keys maneuvers your craft in the same direction as the key pressed while aiming the target zone in roughly the opposite direction, making it extremely difficult to collect items and line up shots at the same time. Oh, and the primary enemy in this episode is the flying monkey drone; that’s worth mention. I plan to replay both Aqua Zone and Sky Fortress soon so I can complete both missions and unlock the secret mission using codes from all 4 regular games. The strategy will be a pacifist approach: just concentrate on collecting fuel tanks and dodging enemies until the end of the mission. It was a late night at work and I don’t have much time for a game tonight. No matter– I have some games reserved for just such situations. 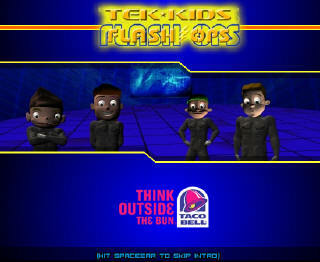 I started and completed Tek-Kids Flash-Ops: Mission: Data Island while capturing a complete set of screenshots, all in the span of about 10 minutes. I was partially correct in my hypothesis from the last Tek Kids entry when I guessed that Data Island was some kind of virtual island. The intro explains that Data Island is a giant mainframe that is as big as an island. While the intro explains that it’s on the water somewhere, the action seems to take place in some cyber-looking virtual location. And while there is no explicit environmental theme, Data Island’s purpose is to take control of all the world’s computers to world domineering ends. The action is more similar to Polar Mission than Aqua Zone as movement principly occurs in two dimensions. The craft on which the Tek Kid travels can move up in short bursts but I’m not sure if this has any practical application in the game. I just checked and the craft in Polar Mission can do the same thing. But flying high or low makes no difference for touching objects. I made it through all 3 segments on the first try. Let’s hear it for me. I must observe that the segments seemed longer than in the previous two games. The code for this game is AR93, if anyone is keeping score. 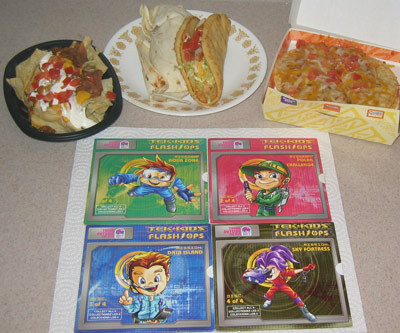 Remember that Taco Bell Tek-Kids Flash-Ops game? There were 3 more games in the series. Thanks ever so much to Maxx Marketing, the publisher, as well as their distributor, Yum! Brands, Inc. for graciously furnishing me with the remaining 3 games. It’s a heavy responsibility but I shall fulfill my duty to play through them and preserve their essential statistics for all time via MobyGames. Plus, I want to see that bonus game. This episode of Tek-Kids Flash-Ops is titled Mission: Aqua Zone. It seems Dr. Havok is back to his old tricks (to be fair, since this is #1 in the quartet, this would be Dr. Havok’s inaugural outing). This time he has an underwater sub that doubles as a weapons factory catering to rogue nations. However, the mortal sin being perpetrated by this leviathan is that it is polluting hundreds of square miles of pristine ocean blue (nautical miles? The difference is undoubtedly important). I can just tell that all of these games are going to have some kind of environmental message. This somewhat reminds me of some really cheesy Star Wars stories I read some years ago. Each of 6 stories between 2 books was a flagrant allegory for some environmental cause here on earth. I made it a game to figure out as soon as I could in each story what the message was going to be: Save the whales, save the rainforests, etc. Along those same lines, I will try to guess the environmental terror Dr. Havok plans to spread in the remaining 2 missions, Data Island and Sky Fortress. My wager is that the latter is pumping raw pollution into the atmosphere but I’m a little fuzzier on the former. When I think of an island, I think of water, but he’s already polluting the ocean in this adventure. The “data” part of the title may indicate that he’s polluting the internet somehow from some virtual island. In addition to only moving left and right, you can also move up and down. However, there are essentially two things you’re controlling with the same set of cursor keys: Your swimmer and the target. They move in opposite directions and it’s quite difficult to keep them straight. It’s a good thing this all takes place in shallow water– that makes things more graphically interesting. I started out this evening playing some more Hot Wired and actually finished 3 of the 10 tracks. I think I’m well on my way to being able to write the authoritative strategy guide for the game. But duty requires that I soldier on! 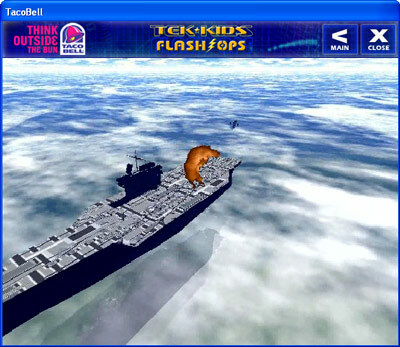 Tonight’s game is a Taco Bell promotional game, Tek Kids Flash Ops– Mission: Polar Challenge. You might be surprised enough to learn that there is a Taco Bell promotional game, but wait until you find out that this is actually number 2 in a series. This is actually the first of a great many promotional tie-in games that I have in my possession and look forward to playing. This title is not very well-known: A Google search brings up an entry I wrote about it on another of my blogs. Based on the CD sleeve packaging, this Tek Kids promotion must have run from August 3 through September 6 of this year (the sleeve says that you can call for technical assistance between those dates). The primary game enables the player to select from one of four Tek Kids to carry out a special mission to stop a particularly insane villain, Dr. Havok, from inflicting his namesake effect upon the world. How insane is he? Insane enough that he saw Al Gore’s global warming movie, An Inconvenient Truth, and decided that the best way to blackmail the world’s governments would be to accelerate the warming process by manually melting the polar ice caps with what the game describes verbally as a giant radar attached to a tank. I was eager to jump right into the gameplay and see exactly how they managed to tie tasty tacos and burritos into what was sure to be a fast-paced action game. I am happy to report that Polar Challenge delivers, at least for a brief, free, promotional tie-in game. The principal action has your character piloting a little hoverjet over the ice, on your way to take out the problematic tank device. On the way, there are skiing robots that will try to trip you with their ski poles, spiked mines and some other exploding weirdness. On the plus side, there are 2 different types of weapons to pick up, as well as 2 types of powerups– fuel tanks to keep your jet craft moving, and spinning Taco Bell insignias to keep your life meter up. So that’s the tie-in! Taco Bell = life! You have to maintain both your life meter (getting hit drains it) and your fuel meter (just moving drains it) or it’s game over. A frustrating aspect at the outset was that the game would abruptly end with Dr. Havok laughing himself silly– it would have been nice for some indication about exactly why the game was over. There are 2 different weapons — a green ring weapon and a pink cube weapon — but neither seems to be more powerful than the other. Also, there are copious warps on the mission that give you a major speed bump and make you bump into enemies much faster. The game features 3 segments, each with progressively more obstacles. While the game has 4 characters to choose from, that doesn’t necessarily give it any particular replay value– the 4 different characters are apparently in place to fulfill certain demographic diversity goals, though someone put in a lot of effort to define different profiles for each Tek Kid. After completing the game, you get a 4-character code. If you get the codes for all 4 games, you can unlock a bonus game. This implies to me that all 4 games carry the bonus game. The code at the end of this game is PXM6. Searching for the string in the binary is fruitless. I can’t imagine the developers put a lot of effort into an difficult-to-hack code system. However, only one character from each of the 4 4-character codes is used to unlock the bonus game, so it’s reasonable that the PXM6 string would not occur in any binaries (and the screen where it is presented is graphical). From the code screen, I learn that the other 3 missions are titled Data Island, Aqua Zone, and Sky Fortress. I may make some trips to area Taco Bell restaurants and inquire about any CDs they might have in the back. Yeah, I’m just that lame. 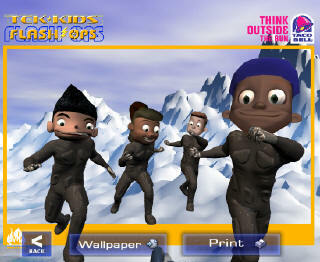 One last feature of the actual game is that it allows you to create desktop wallpapers featuring the various Tek Kids on top of polar locale backdrops, with a “Think Outside The Bun” logo, and even that’s customizable. The CD sleeve also contains a number of different puzzles including a connect-the-dot puzzle and a secret decoding message puzzle. The code is to drop the first and last letters of each word. Fiendish. The funniest puzzle is a picture of the Havok global-warming-accelerator tank, and the viewer needs to find the items that don’t belong in the picture, items like pliers, wrench, and snowshoe. I take this as a tacit acknowledgement that there’s nothing wrong with the tank being in the picture. The game is the product of a firm named Maxx Marketing. Apparently, there is a long-running campaign based around Spy-Tek that they created for Taco Bell. 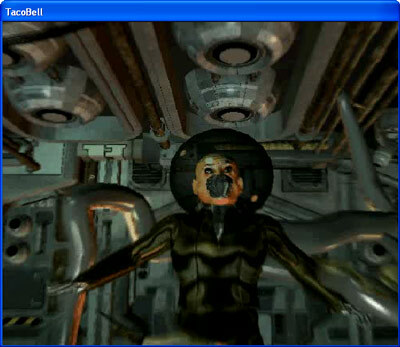 For multimedia trivia, underneath the covers, the game uses a lot of FLV files for full motion video. Flash-based game? That would certainly ease time to market.